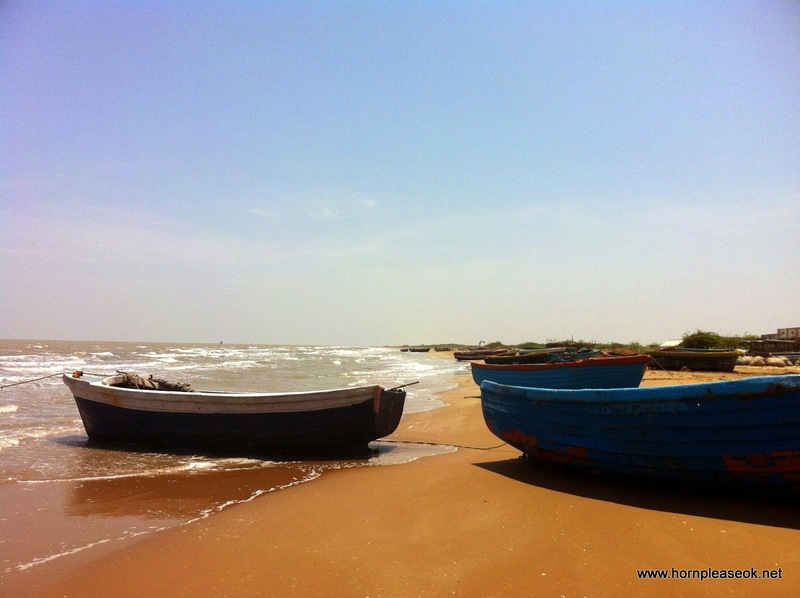 Coastal South India : Pondicherry to Rameshwaram | Horn please, OK? Music is the best companion on a road trip. Especially when there's a domestic spat brewing inside the car. Our beautiful Koleos came fitted with a top of the line Bose sound system that does an admirable job of drowning out out name calling and dissent. In retrospect it was a good buy. 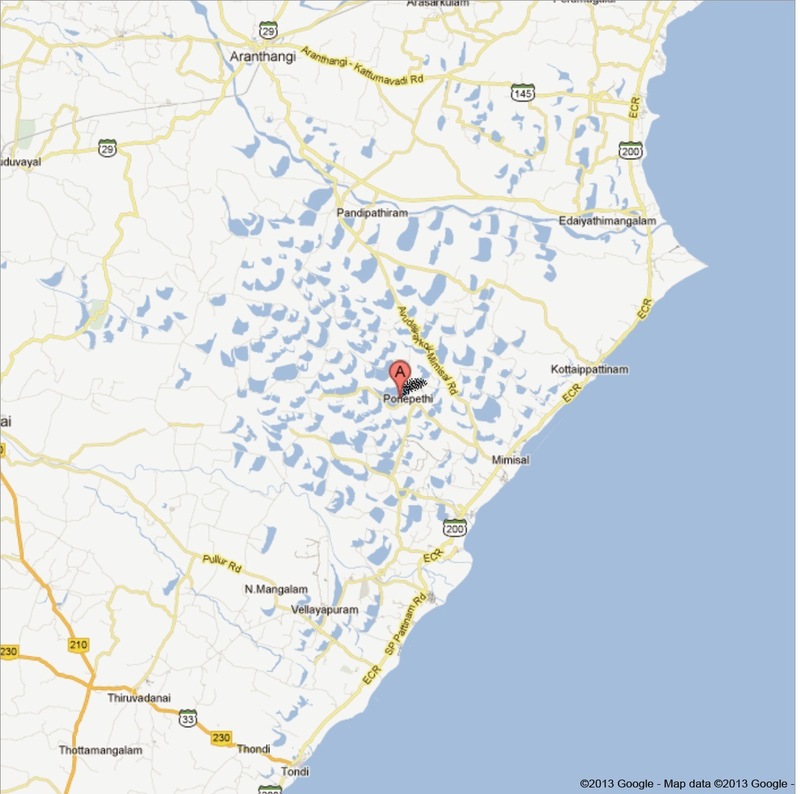 In our original plan our first stop was at Nagapattinam, approximately 150 kms or 3 hours from Pondicherry. 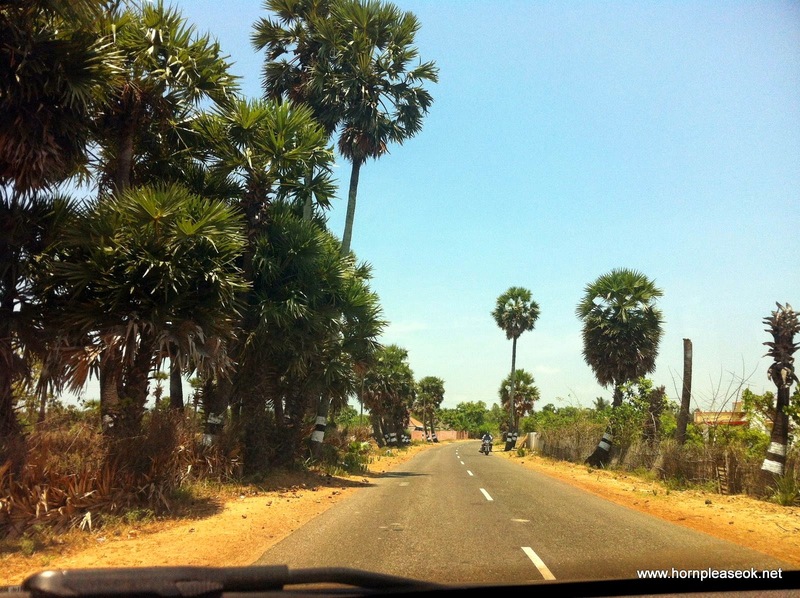 Its a straight road down south passing through Cuddalore, Chidambaram (known for its dancing Natraj temple) and Sirkazhi however traffic is bad and the road narrows and is potholed in some places. 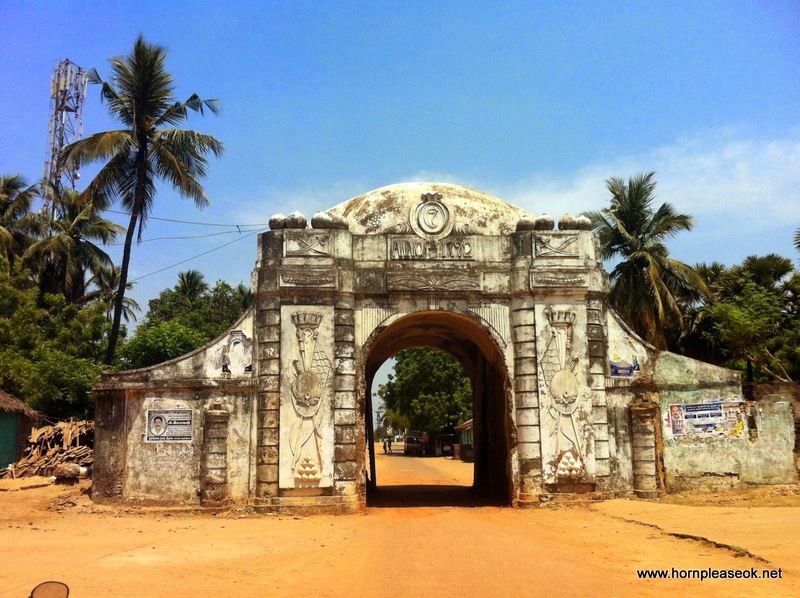 We made good time thanks to an early start and were on the outskirts of the port town when we came across a road sign welcoming us to Tranquebar. Further down the road there was a dilapidated arrow pointing to a Danish fort. 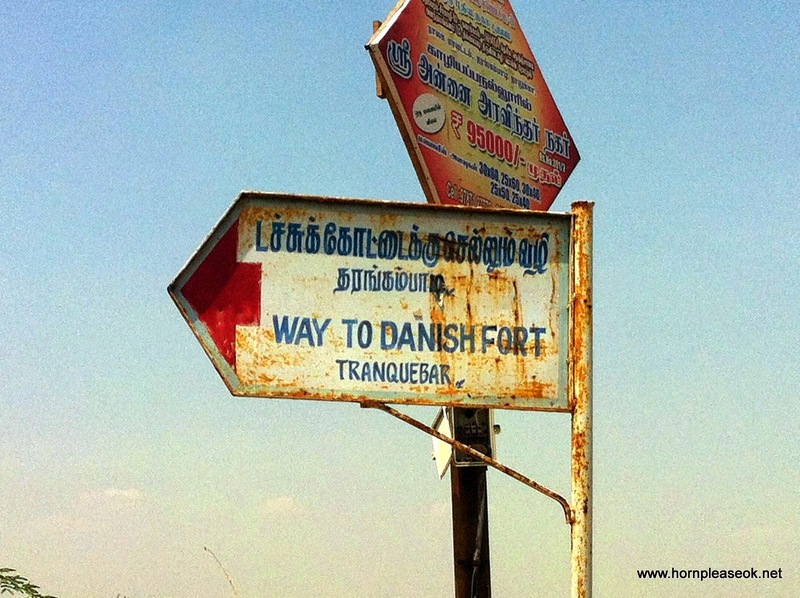 The sign intrigued us and we took a short detour into the charming little town of Tranquebar or Thangambadi, as it was originally known. The land of the singing waves. History goes that the King of Candy asked the Danes to help protect Ceylon from the Portuguese in return for trading rights. The Danes led by their Naval Commander Ove Gedde set sail to Trincomalee in 1619 in a journey fraught with pirate attacks and a mutiny leading to 300 crew members perishing by the time the convoy reached Trincomalee. Subsequently Ove Gedde landed in India at Tangambadi in 1620 and struck a deal with the King of Tanjore securing trading rights for the Danish King. 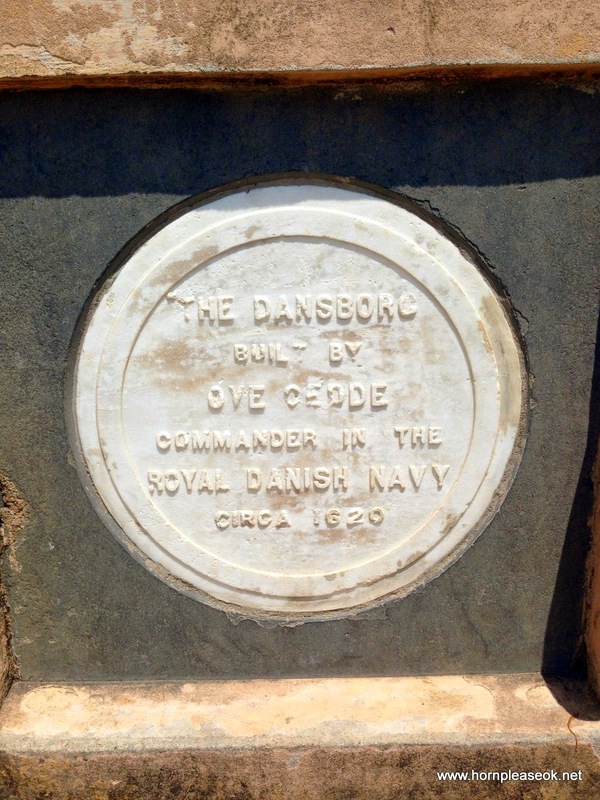 Dansborg, the fort was built in the same year as a trading outpost and was used as a godown and prison. 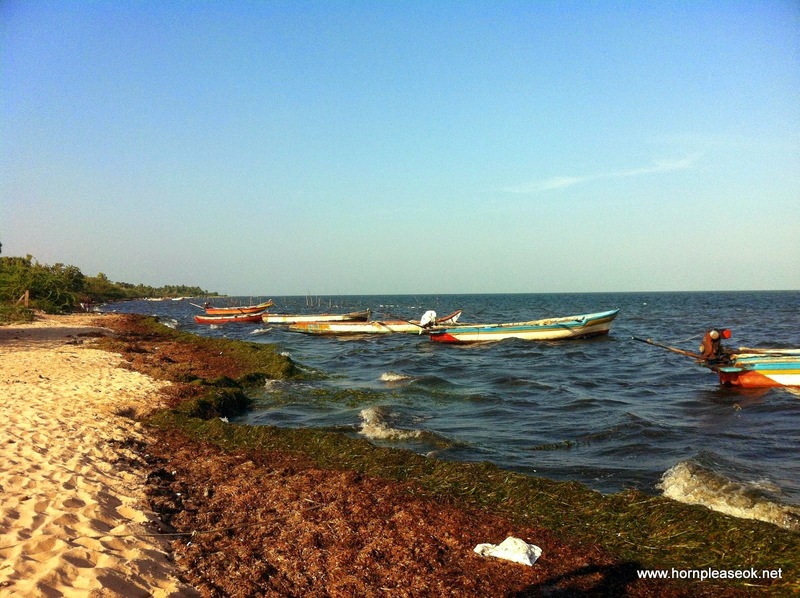 The fort runs parallel to the beach with an unfettered view of the bluest of waters. 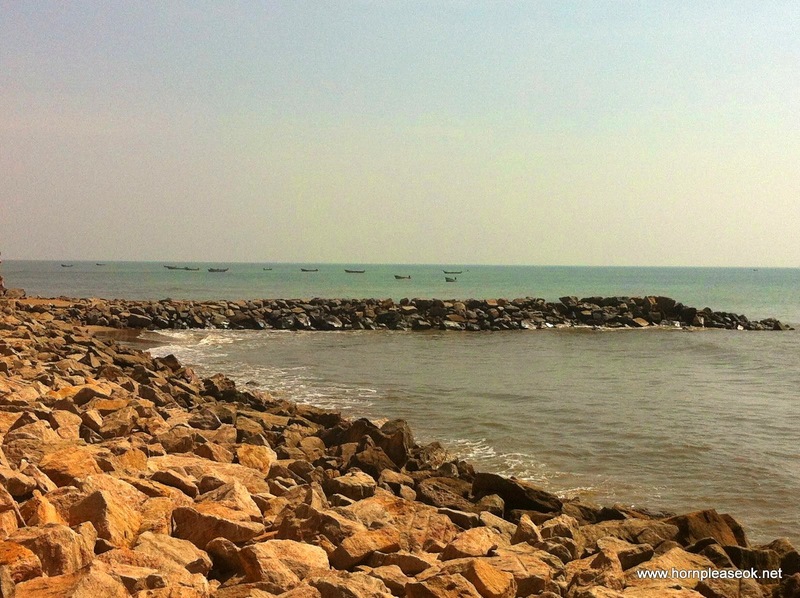 Remains of the fort wall and pier jut out into the sea and form a small lagoon for fishing boats to be anchored in. 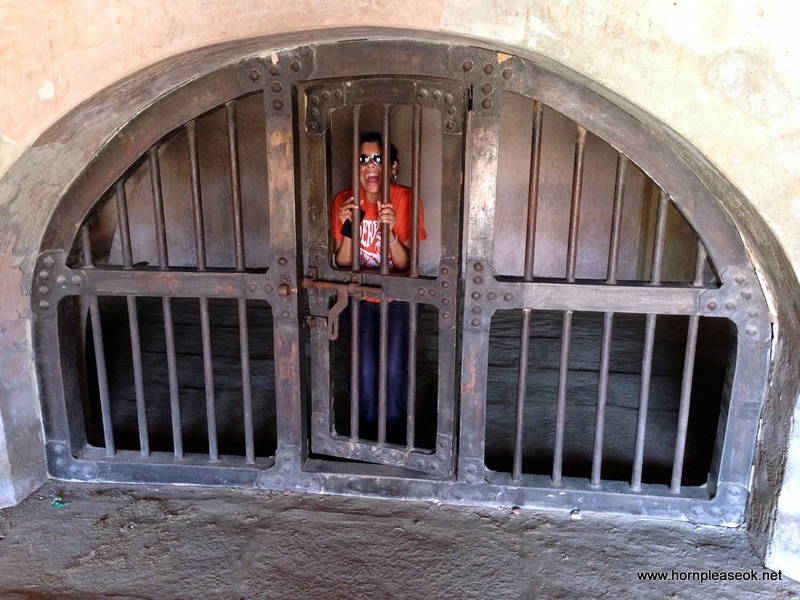 The fort itself has been converted into a poorly maintained museum with some Danish artifacts. 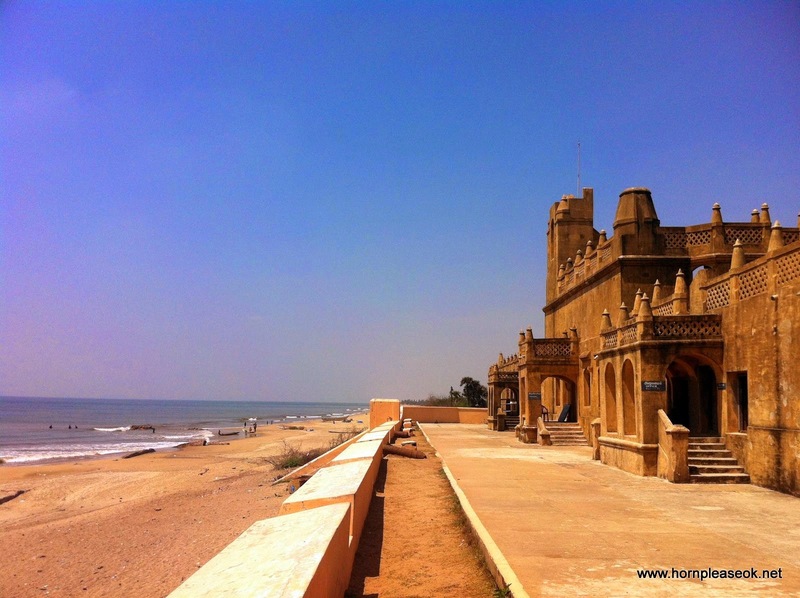 The real beauty of Tranquebar lies in its anonymity and the unexpected brilliance of the sparkling waters, a shade so beautiful, it deserves a name of its own. 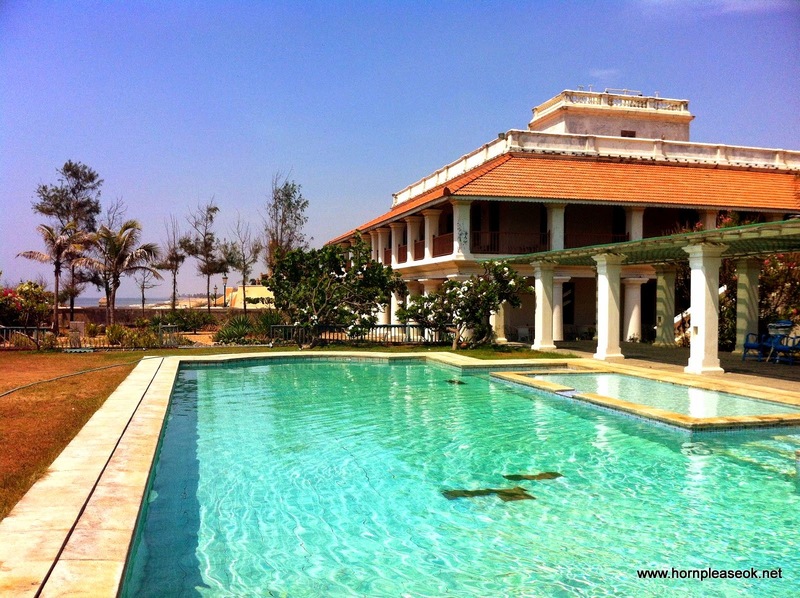 Adjacent to the fort, separated from it by a rectangular park is the Bungalow on the Beach, a Neemrana non hotel. Its a stately house with large verandahs and and white wicker chairs. Once the British collector's house, the bungalow was taken over by the Neemrana group and converted into a B&B. Over breakfast we learnt that the Bungalow on the Beach was renovated and thrown open to guests in 2004, two days before the Tsunami struck. Luckily for them the most damage the property suffered was a couple of broken walls. 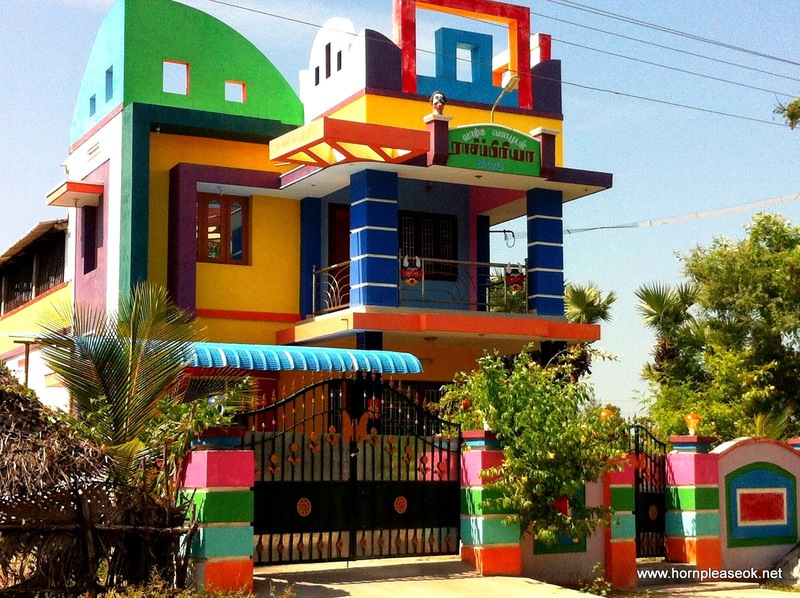 The present day Bungalow bears no scars of the past and looks peaceful and pristine against the blue sea. 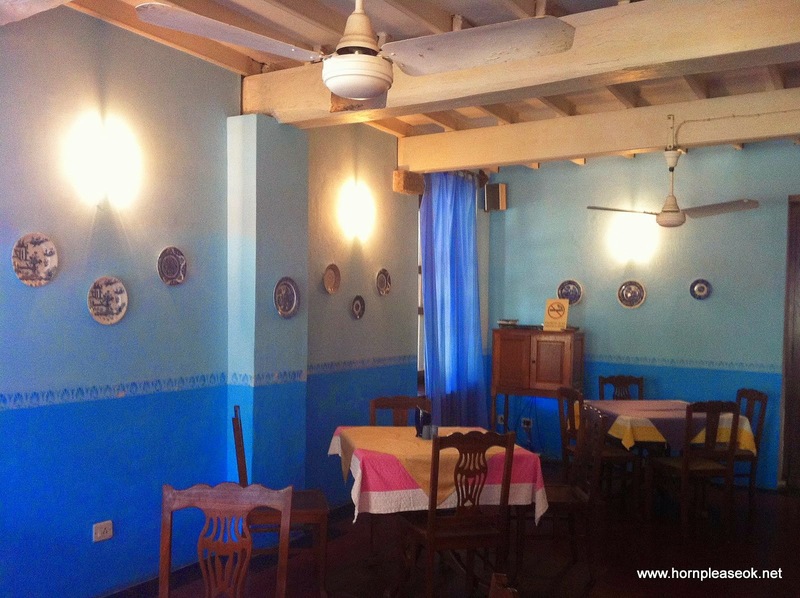 We'd love to come back some day and stay for longer than breakfast. The East Coast Road (ECR) wound its way through the countryside. 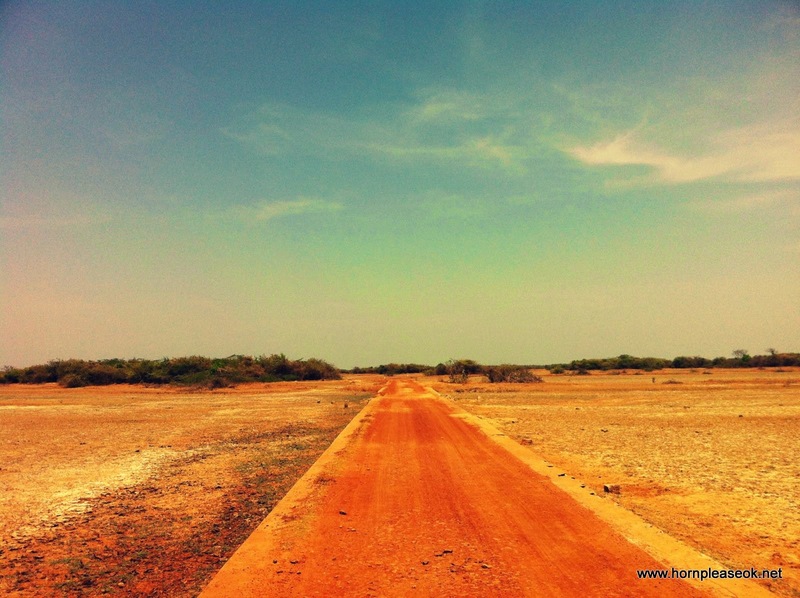 We're very impressed with Tamil Nadu's roads. Amma's done something right. Or do we owe this to her arch enemy? The scenery keeps changing every few kilometers. 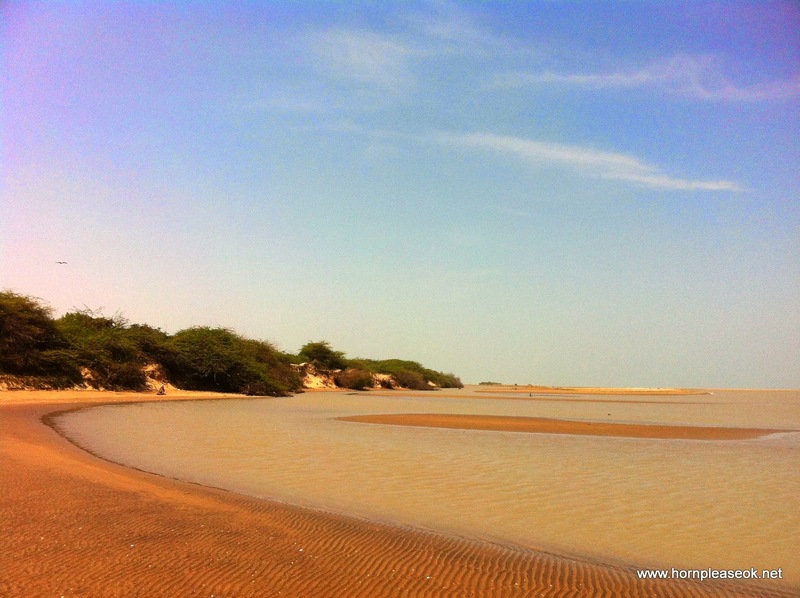 You see stretches of from swaying palms, lots of scrub land, some salt pans and examples of fine modern day architecture. 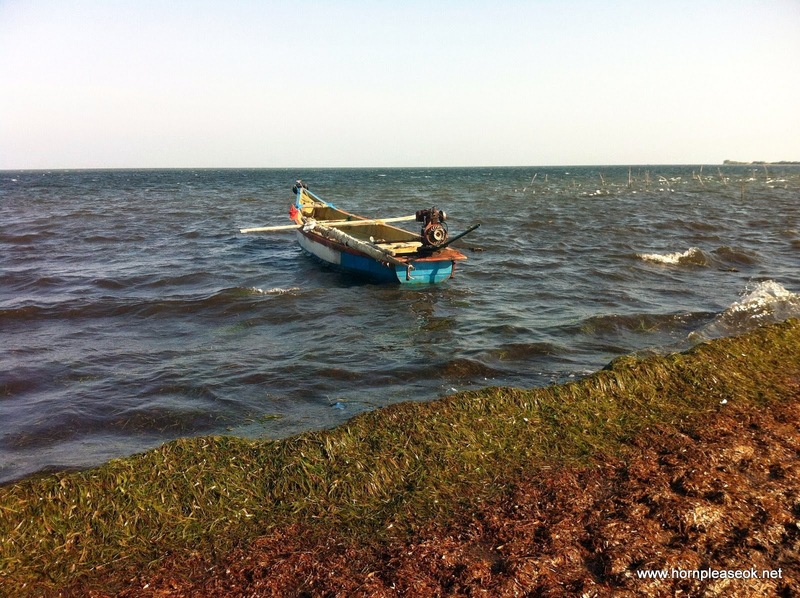 Following the (ECR) through changing scenery we reached our next port of call, Point Calimere. This is the point on the Coromandel coast where the coastline turns ninety degrees to the west and makes a clean right angle. 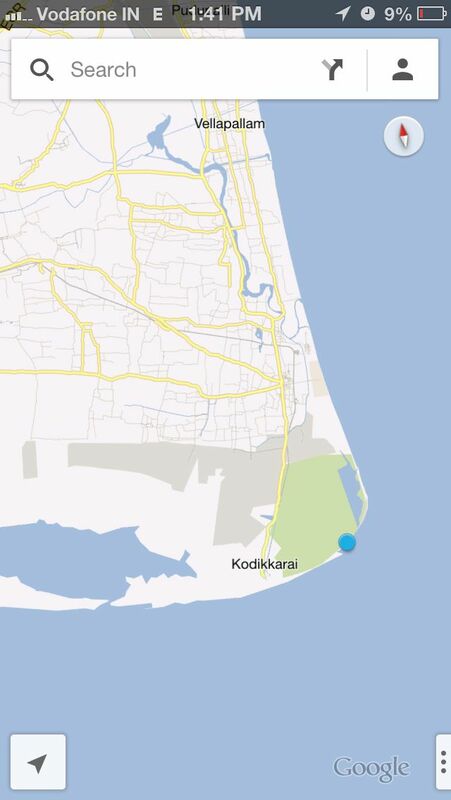 To reach Point Calimere, you need to go straight down south after Nagapattinam instead of turning right with the ECR. 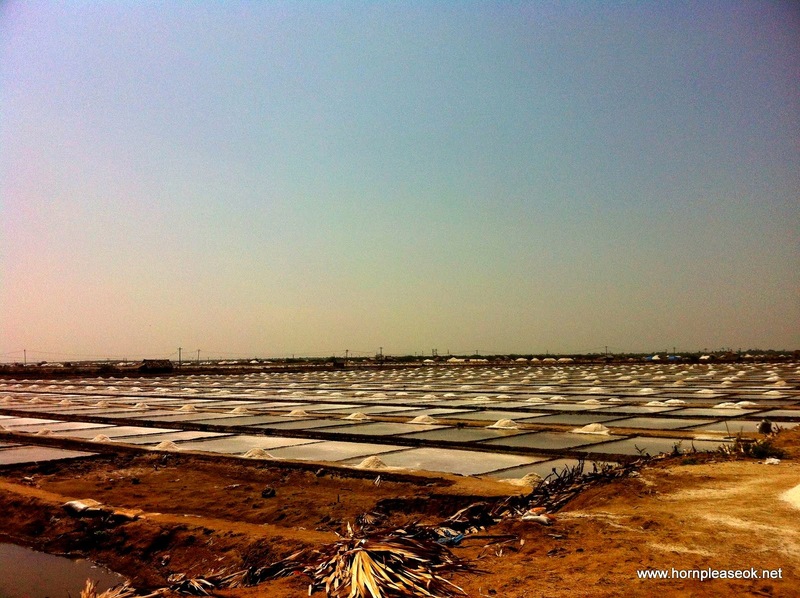 The approach road is flanked on either side by salt pans and massive mounds of crystalline white salt. 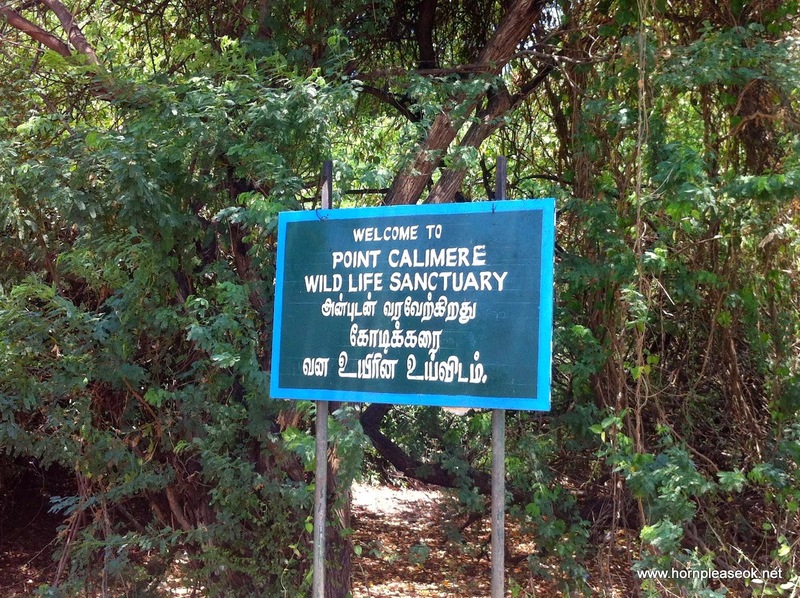 The first marker on the road was a sign announcing our entrance in to Port Calimere wildlife sanctuary known for the Black Buck. We drove on for a few more kilometers past small shrines and mosques till the road ended in the middle of a fishing village, a few feet away from the sea. 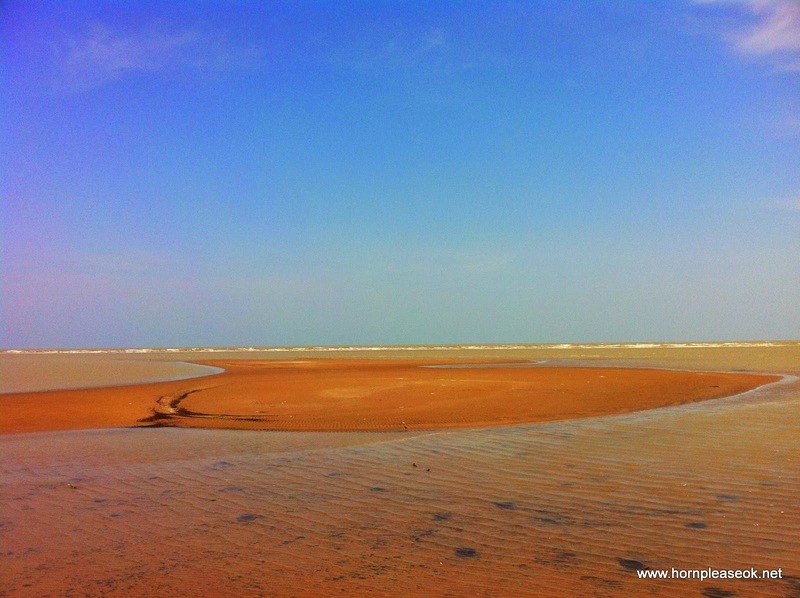 The beach looked deserted and apart from a newly constructed lighthouse there wasn't much to see. 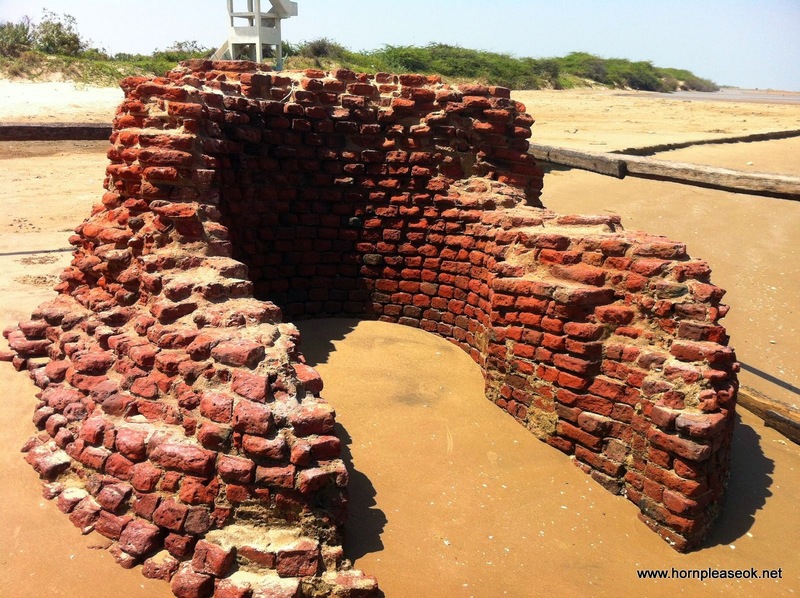 Having done some reading up while planning for the trip, we'd come across a mention of an old lighthouse built by the Chola kings. Determined to find it we drove down a mud road which we'd earlier ignored. This is where the 4x4 on the Koleos came handy and after some dead ends, encounters with squawking chickens and a goat who refused to give us way we found our way to a nondescript building which serves as the office of the wildlife sanctuary. 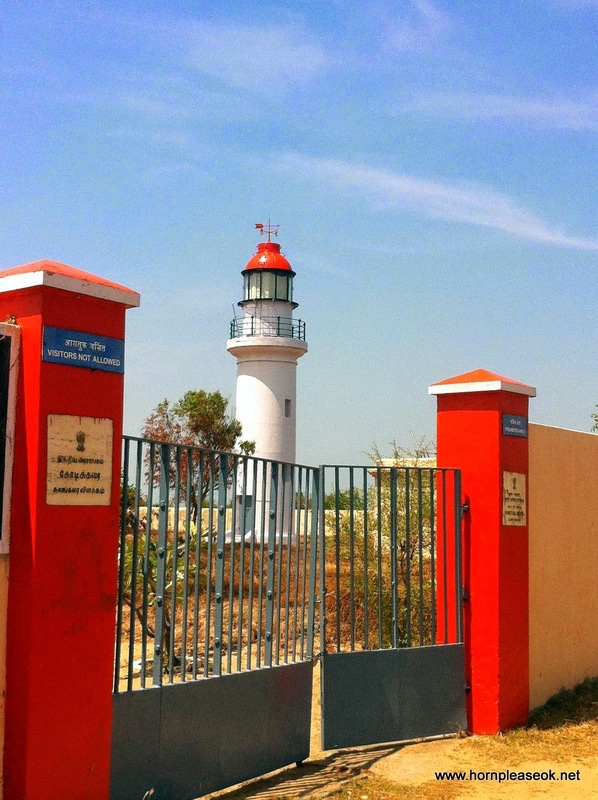 The old lighthouse lies inside the sanctuary, a 7 km drive from the entrance. Armed with this information we followed a red kaccha road till we spotted some movement in the scrub bushes in the distance. It turned out to be a Black Buck regarding us with as much curiosity as we would have, it, had we seen it first. It was joined by a deer and the two of them gamboled around our car like puppies in a park, pure joy to watch. At the end of the kaccha road stood the old light house, only it wasn't as old as we'd hoped. It was built by the British and very much intact. The road ended a couple of meters later and we now faced a wall of sand. Feeling brave and adventurous we clambered over the wall and lo and behold, there lying in the middle of the beach like a decapitated giant lay the remains of the lighthouse built by the Cholas. Not much to look at we know, and we'd have felt let down if it wasn't for this view. Not a soul in sight, not even a crow. 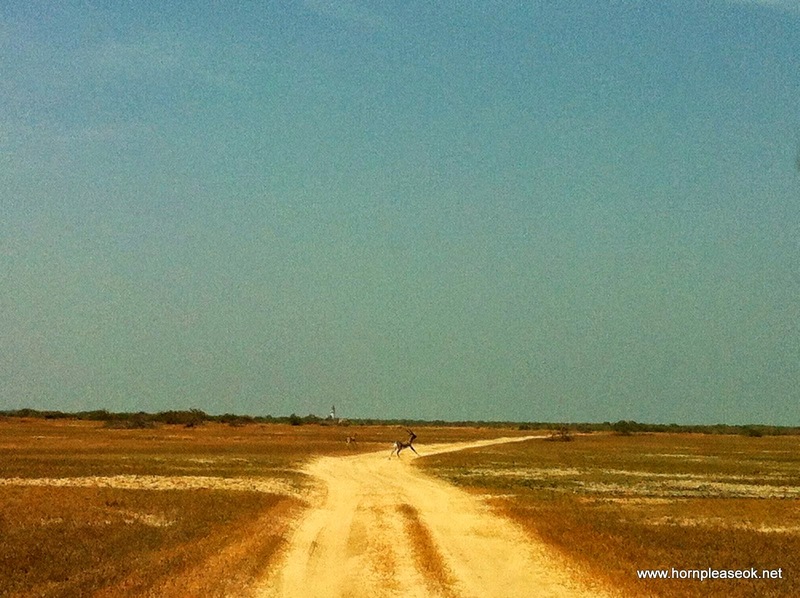 Straight out, 48 kms into the sea lies Jaffna in Sri Lanka. After Point Calimere, we got back on to the ECR. The road till Muthupet is narrow and a bit confusing as it goes through small villages with almost no signage in English. 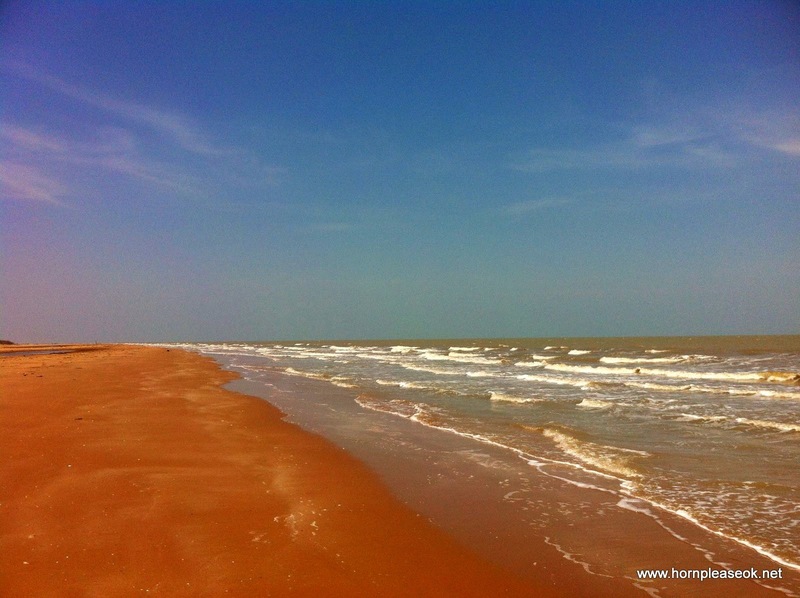 Soon after it reverts to its old self and flows south hugging the coastline and offering some breathtaking views of the Bay of Bengal. 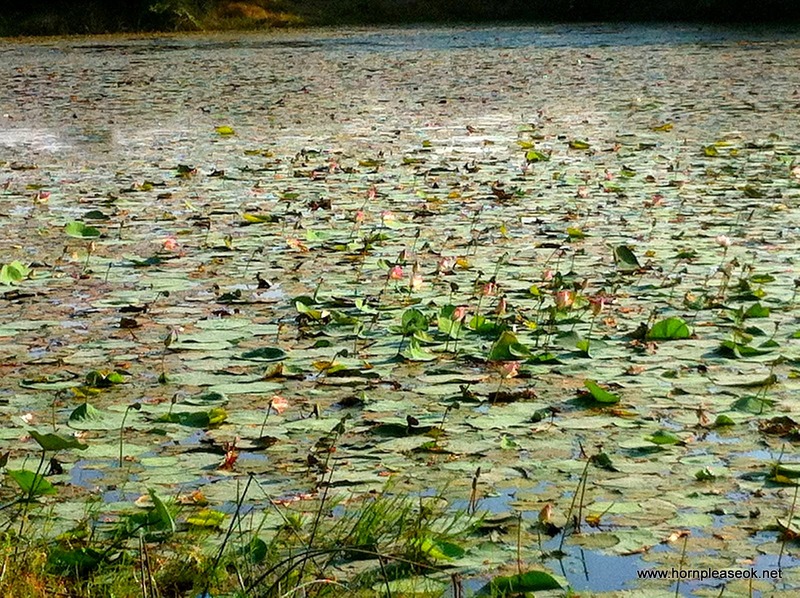 In reality it turned out that most of the lakes had either dried up or changed into marshy splotches. 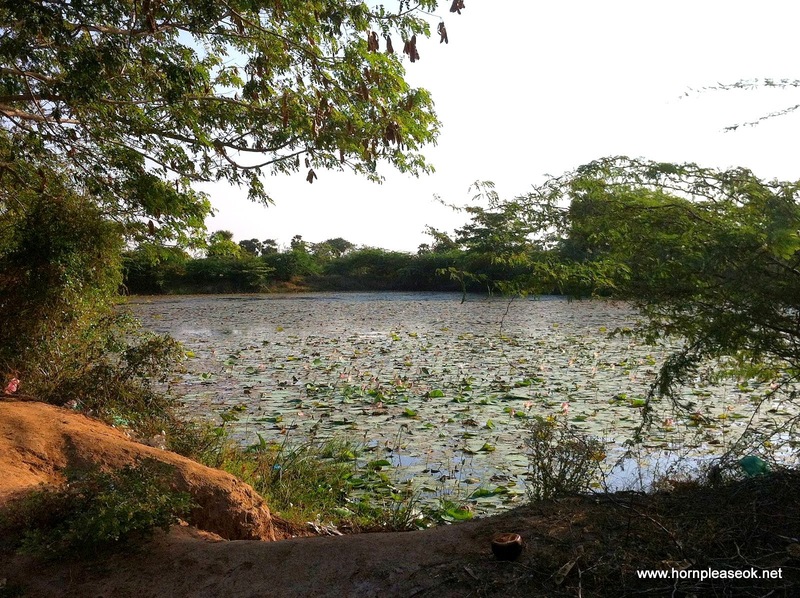 Some 'lakes' were even being used as agricultural land! Ah well, nothing ventured, nothing gained. Some of the lakes may fill up during the rains so in case you want to drive through, take a right at Mimisal and you can wander around the narrow village roads exploring this rather unique topography. 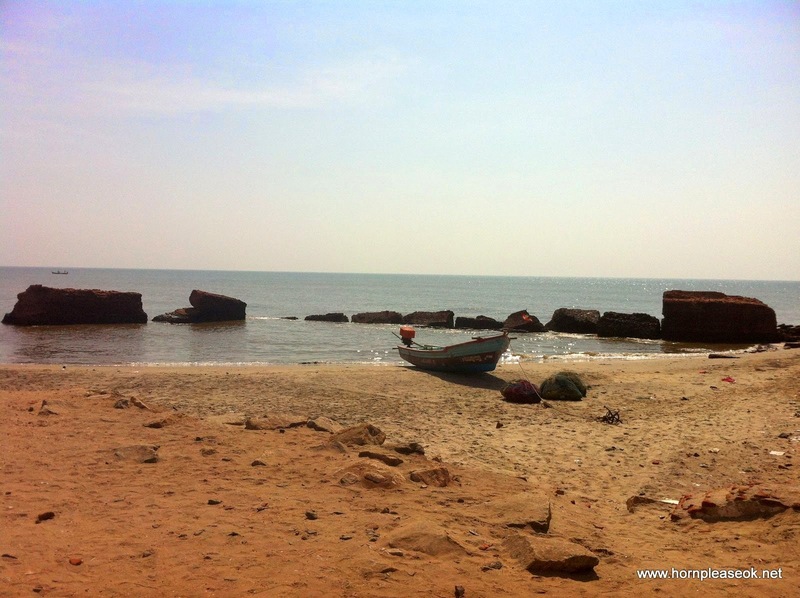 Many adventures, misadventures and some domestic spats later, we reached Rameswaram at 730 pm, long after sunset and too late to take in the panoramic views offered by the drive into the island. 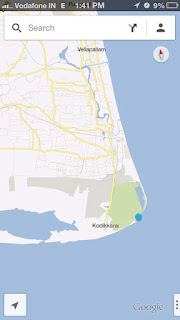 The road between Mimisal and Rameshwaram is good but it was already dusk by the time we bypassed Ramanathapuram (approx 50 km before Rameshwaram) so the last stretch took more than an hour thanks to heavy oncoming traffic and the Indian penchant for driving on high beam. 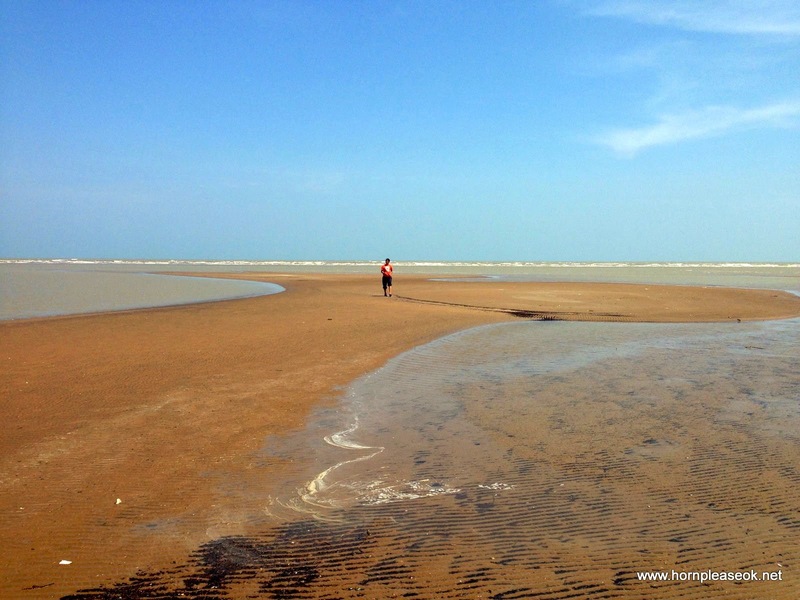 We checked in to the spanking new Daiwik Hotel, in our opinion the only place worth staying in at Rameshwaram. Only a year old, the rooms are clean, food excellent and most importantly the staff knowledgeable and helpful. Upon check in the concierge informed us that being 'Amavasya' (new moon) there was a special celebration at the temple which would end at 8 pm. 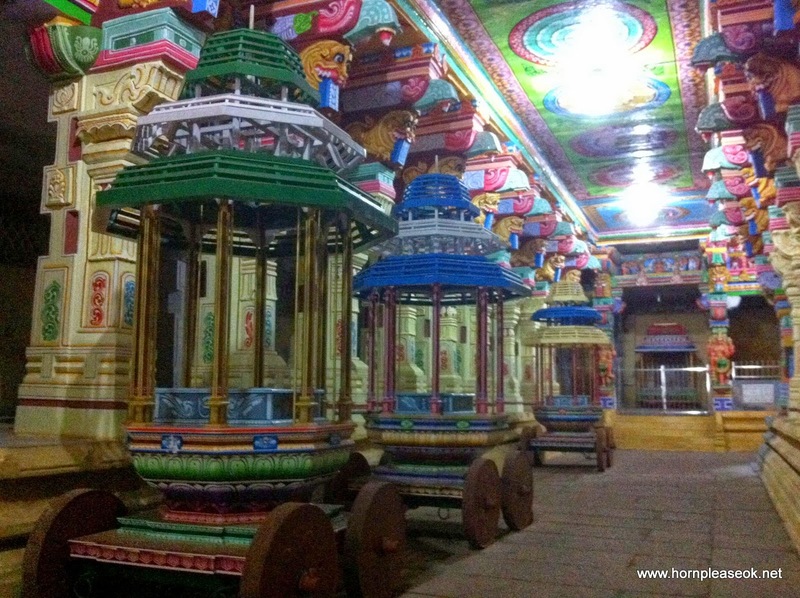 We literally dropped our bags, hitched our proverbial 'lungis' and ran to the Ramaswamy temple. Alas, it was not meant to be thanks to a complicated parking ordeal. 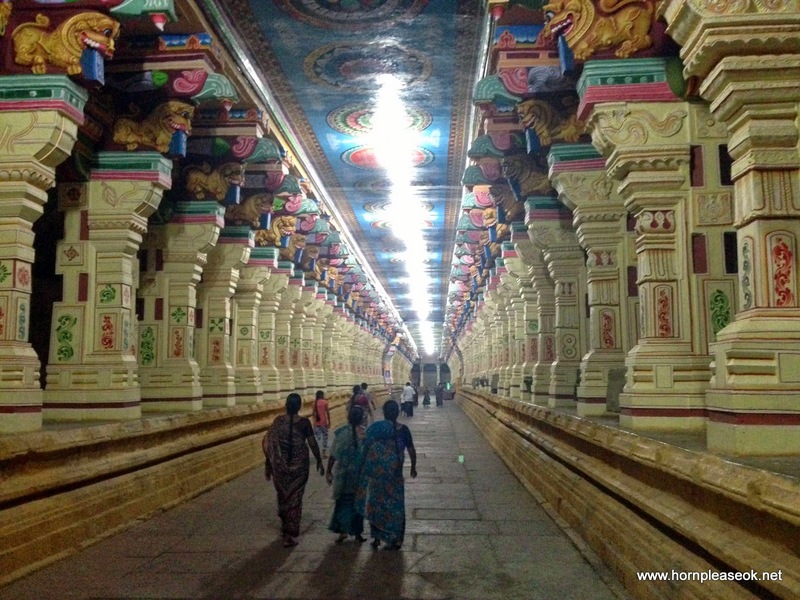 While we missed the special prayer, we did explore the temple premises and saw some of the famous 1212 carved pillars. 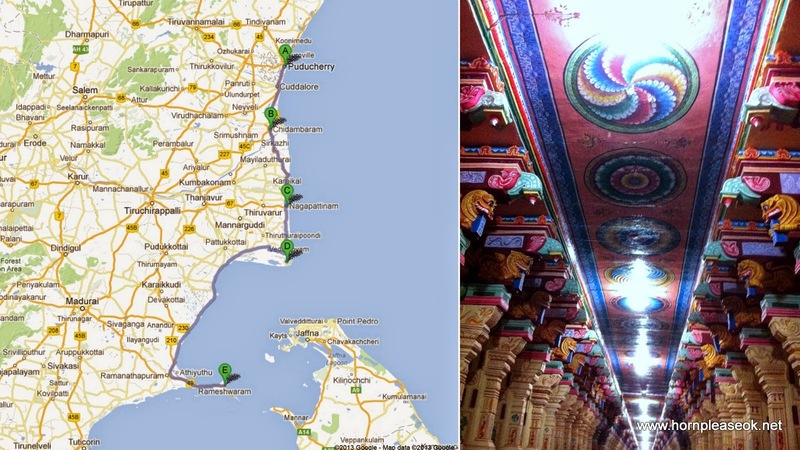 Rameshwaram's other sights like Pamban bridge and the sandy shores of Dhanushkodi would have to wait till the next day.